I actually started this post in December to talk about my heart issues that I was still experiencing from earlier in the year. Either timing or for reasons that I really don't understand I never got around to posting it. Here is a little recap for some of you that are just joining us. I decided to start blogging about this last year when I starting experiencing chest pains and palpations about a month or so before Buffalo Springs 70.3. I went through a few tests that found that I was in good shape, and the only problem that was found was that my genetically awesome ability to produce cholesterol was doing well at a total of 243 (should be below 200). I have kept having the same heart issues for the last year. I have been able to pin point some triggers, but there are still times where I just have issues. Even the last race I started experiencing chest pain around the 5th hour, but I have now trained with this for so long that I know what is my normal issue. The doc even had me do a holter test for 24hrs to see if anything was detectible, but it happens so random that everything came back clear. So he has added a med that I should take if I experience an issue, but as I was feeling the scrip the pharmacist told me that considering the condition I am in (lowish HR) I might experience times where I pass out. If I take this it will have to be bad!!! If you see me acting like the video below of the great Redd Foxx don't worry it's normal. Now to add to this nonsense of not really finding out if anything is wrong with my heart. I badly strained a ligament on the back of my knee right after the Tall Texan race. So I have been having to take it easier and swim a lot. I did have to pull out of the Willie McCool race, but it was great getting to volunteer and ride around with one of the very passionate race directors Nick Cordes (Great race by the way). Surprisingly, I am staying calm about all of this, and Tim will let me know when the time comes that we might have to talk about pulling out of the HITS race in Marble Falls. Below is the video that Tim sent me to explain his philosophy on how to handle this injury. As usual when I am not training at my normal levels before races I start feeling out of whack. Part of it is that I like how my body feels when it is being pushed, and then part of it is my time I get to spend with my faith or talk to my Dad. It is a time I need that keeps me balanced, and even though I have a day off today to help with healing. Things don't don't feel right. I know that even if it wasn't this it would be something else, and I am not doing this for the next race or even this season. I am doing this to fight for my health for the next 20-30 years, and hopefully inspire others. I know If I wasn't doing what I am doing I would reach a point where I might not have the ability to fight. These years we have aren't free. So tomorrow will be a new day, and I will be ready to fight. 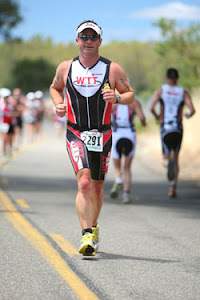 When I was thinking about this years races I kept wavering back and forth on doing the Tall Texan this year. It is a great small but tough race that is good to kick the season off. My wavering had more to do with us running out of "free" time, and I wasn't sure if we wanted another weekend away in our budget. So a few weeks ago Jerred and I decided to just go down without families and race and then come right back. As the time started getting closer I was really doubting if I was in the shape I wanted to be in for a 70.3 distance race. The answer is that I knew I have been in better shape to race competitively, but I also knew I was in good enough condition for a long day of training. I think that my higher than normal stress in the rest of my life made me not anywhere near my normal pre race freak out mode. Susan even committed that I was nearly blowing off the fact that I was just going down to race a 70.3, and as usual she was right (don't tell her I said that). This transition I have made over these last few years has made me forget the struggles and pain from when I shifted from "working out" to "training." The pain has both been mental and physical, but it has melted away the part of me that says "I can't" to more of " Hell! why not." Before I knew it Saturday morning was here, and I was rushing to get all of my crap out in the front of the house since Jerred was going to come pick me up. Then I finally looked at my phone a saw that he had texted that he had something come up and couldn't go. After calling him and finding out he wasn't screwing with me I had to make my decision if I was going. Susan and the girls couldn't go, and in case I got hurt Susan didn't want me to go by myself. I knew there was only one person I could call who would be up for a last minute adventure, my Mom! So I called her, and she told me that she had just gotten back from Kerrville the night before , but she was good to go. Thanks again Mom! After a great ride down to San Antonio we picked up my packet, and I found out that only 85 people were signed up for the race. Mainly these people were like me and were ignoring the weather forecast of very freaking cold and windy( Ron Roberts would love that technical weather term). Then I got in a bike ride and a great dinner while waiting for the front to hit. My first indicater the next morning was the sound of the wind, but considering our standards in Lubbock it didn't really sound that bad. As we got closer to the race sight I could feel the car shaking a little from the wind, and was thinking well maybe the swim will be cancelled and we will do a duathlon. I even told Mom to just stay in the car since it was so cold (around the 40's, windchill maybe high 30's) I probably wouldn't be swimming. Then they announced that we were going to have the swim it was just going to be a little short, because one of the buoys had blown way off course (WTH!). The one good thing about the swim was that it was warmer in the water than it was outside. The start of the swim I felt like I started off well but that only lasted about five feet then the white caps started hitting me. I had a good clear line to swim, but really felt like I wasn't making any headway. If I breathed on one side I got choked by the waves, and on the other side I was blinded by the sun. As I was sighting the front pack coming in I thought that I was way at the back, but with the waves we had all gotten so spread out I was actually 19th with a 28:02 swim. Being cold and wet did not make for a quick transition, but I did have the sense to put on socks and gloves before leaving. This bike is a tough very hilly course without bad weather, but I had no idea how bad it was going to be today. The temps were still low, and the winds were staying in the 20's with gusts in the 30's. One of the first down hills that I should have been going 20-25 on was going 12-14 because of the wind.The cold was so bad that at the first water stop I pulled over so that I could get someone to tear open my gel, because I couldn't feel my hands well enough to hold it. The whole day felt like I was in some of the worst cold head winds I have been in. I would love to say I stayed strong mentally and just powered through it, but the truth is I was hoping for a flat so I could quit. One of the only things that kept me going is that I thought if I quit I would have to wait a couple of hours to get my stuff out of transition (The truth was so many people were dropping out they were letting them get there stuff out early. Glad I didn't know that). One of the last things that really demoralized me was the last 20 miles I was completely by myself. The only way I would know I was still on course is that I would see some white arrows on the road. I will say that I once I finally have a tailwind near the end for a few miles, and I was instantly going close to 30. Only one racer (not me!) had a bike under 3 hours and he was a pro. 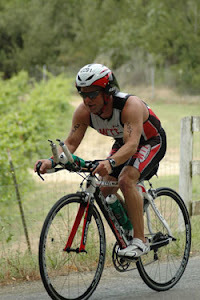 I ended up losing a few spots back to 24th with a 3:31:47 bike. Before my run my transition was another horribly slow one, but this time it was because I couldn't feel anything and was cramping. When I finally got going I ran up a hill and was running on the dirt dam when I thought I had a rock in both shoes, but it turned out to be only my frozen feet! To give you the full effect of the cold I didn't get full felling back to my feet until around mile 6-7. Even with all of this I felt very good and strong on the first of a two loop course. I really think that the main reason for this was that it was finally getting into the 50's, and for the first time all day I was sweating. To this point my nutrition was spot on (Thanks Gu!) and I was good and hydrated. I had really been in my lowest point racing on the bike that I have been in a long time, and now on the run I was finally feeling back to normal. One of the things that helps motivate me is yelling for others, but the weird thing about this race is that on the first loop I was way behind the group in front and ahead of the group behind. This meant that for several miles I only saw the people at the water stops, and they were great in yelling us on. I really felt strong through the second loop until I hit a stretch of road that was into the headwind, and had to dig deep into a well that I was sure was empty. My run ended with a 1:56:01, and I finished 21st overall with a 6:00:39. Also, I would like to add that only 57 of the 85 folks signed up finished this race. To sum it up I told the race director that this was my second slowest time in a 70.3 distance race, and I was as proud of this finish as I was my best time. He just said with a smile, "It was epic, wasn't it!" To finish with I crossed the finish line at 2:00pm and was on the phone with a plumber, because Susan had been dealing with some bad plumbing issues since I left. Mom and I were on the road by 2:30 heading back to Lubbock. This was a great way to start the season off, and it is crazy what a week will do for your thinking. After that kind of torture I was ready to call off all racing, but then after a few workouts I am ready to go again. Unfortunately it looks like the Willie McCool 13.1 will be out for me this year (more on why later), but the Keebler clan will be out there to volunteer and cheer on all of our racing brothers and sisters.